Our Parish House Museum was built in 1839 as the Methodist Episcopal Church. It was located near the Crocker Quarry, but in 1850 it was moved on to logs and rolled to its present location at 72 Church Street. For years it was the Fellowship Hall of the Brownville Community Church, a gathering place for the community. 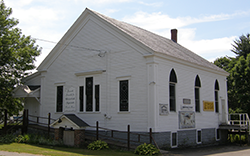 In 1996, the Brownville-Brownville Junction Historical Society purchased the building from the Church and is now home to thousands of artifacts of Brownville's history. 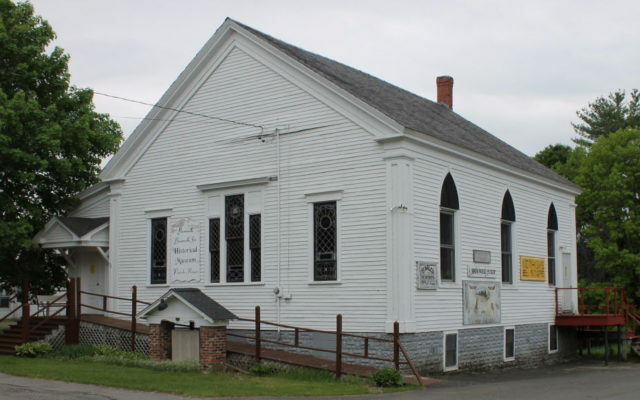 BROWNVILLE — The Brownville-Brownville Junction (B-BJ) Historical Society and Parish House Museum has had another good year! We have a small number of volunteers who work diligently to keep things moving ahead. That includes keeping the museum open two days a week during the summer and early fall, keeping new acquisitions up to date in our record keeping, inputting information about current items and records in our PastPerfect program, answering inquiries from people who either come in to the museum or email us looking for specific information and organizing what we have to make more information and items accessible to visitors and easier for volunteers to locate. These are just a few of the tasks that we are working on and if you have a few hours to volunteer, your time would be much appreciated. Keep us in mind next summer! We are continuing to market Ken Hatchette’s book and revised book about the Canadian Pacific Railroad in Brownville Junction. There are fewer than 10 copies of the original manuscript still available; this will not be reprinted. The books are currently available at Simple Sacks in Brownville, The Milo and Points North Visitors’ Center in Milo, and from Susan Worcester 965-8070). Ken will soon be working on new books that will be of interest of people in the area. At the September society meeting it was decided to have our 2019 meetings in the evenings so that people who work will have the opportunity to attend. It would be our hope to be able to offer short programs in conjunction with each meeting. If you are a member of the society and received our most recent newsletter you will have read about “Maine’s One-Man Railroad” right here in our area! Very interesting story about Bert Green. And you might have learned a few new facts in our Pop Quiz. Oh, and there is a recipe there for Welsh cookies. There is also a photo there of the old B&A station in the Junction that most of the volunteers had never seen before and one last look at the old Green Bridge as the work on the new replacement bridge comes to an end. Worcester will be getting back to interviewing people who live or have lived in town in order to record their stories for the museum files. If you’d be interested in talking, please call 965-8070 or email brownvillehistorical@trcmaine.org . Thanks to the 60-plus members of the society who help keep us afloat with their dues, donations and volunteer time! All donations are tax deductible. What's New at the B-BJ Historical Society? The museum is open from June through September on Tuesdays and Thursdays from 10am to 2pm. If you would like to visit at another time, please call Susan at 965-8070.